Wheat breeding and genetics professor Brett Carver's research is changing the way the world eats. For nearly 20 years he's led the OSU Wheat Improvement Team, an interdisciplinary group of 11 researchers who investigate and develop new seed varieties with attributes like drought hardiness and immunity to emerging diseases. Their research translates to a healthy agricultural economy in Oklahoma, Texas and Kansas through the production and regional sale of seed varieties engineered at OSU through the Oklahoma Foundation Seed Stocks. The program recently broke ground on a $4 million facility in southwest Stillwater to accommodate increased demand for the latest high-performance wheat, peanut and grass varieties. By providing improved product to the region's farmers as well as the nation's millers and bakers, Carver and his researchers are also ensuring the world's ever-growing population has enough to eat. Professors like Carver - who is the Wheat Genetics Chair in Agriculture - and programs like the Oklahoma Foundation Seed Stocks are why endowed positions at Oklahoma State University are so crucial. 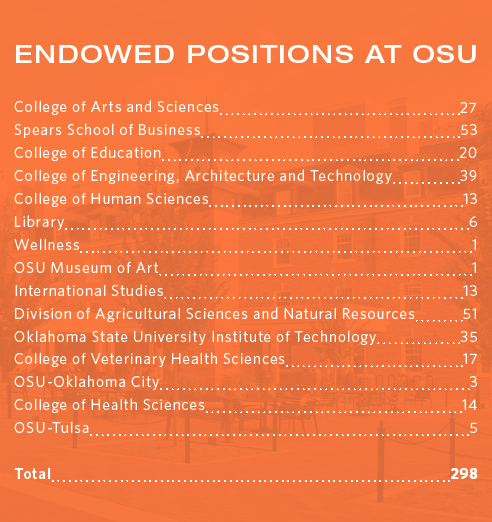 Oklahoma State has nearly 300 endowed faculty positions, all of which are at least partially funded through outside support. The number of available positions has doubled within the past decade, mostly because of Branding Success: The Campaign for OSU, which included $188.2 million for faculty support and $1.2 billion overall in gifts and commitments. For each endowed position, individual donors or corporations have gifted Oklahoma State enough money to endow the position. The gift generates annual funds that the university can count on to help provide ongoing support for increased salaries, hiring graduate assistants, purchasing equipment, funding travel and covering other academic and research needs. Carver uses funds to help support his research, his Wheat Improvement Team of graduate research assistants, equipment and other costs associated with his work. He said funding from the chair has made a big difference, allowing him consistent funding and the flexibility to quickly adjust his research to address industry problems in real-time. It's helped put OSU on the map in terms of wheat breeding and genetics. 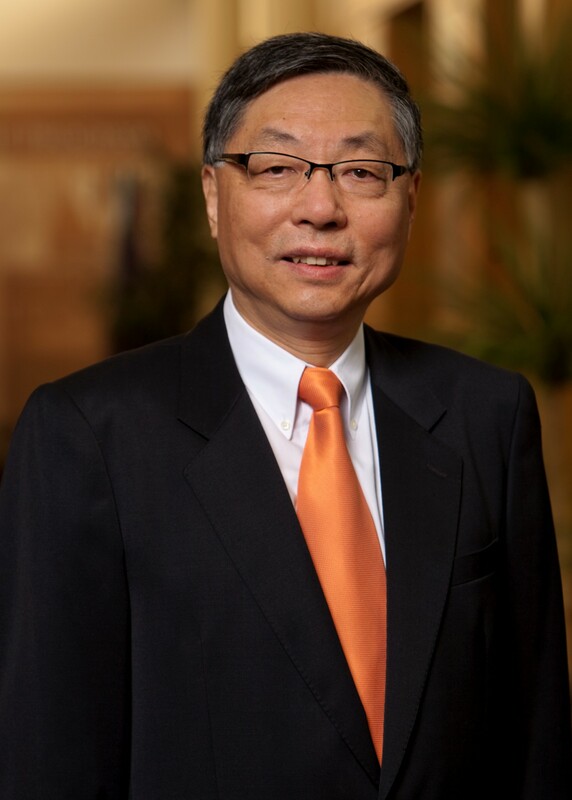 Endowed positions, a distinguished honor for faculty, are important to OSU's land-grant mission of research, instruction and extension, said Provost Gary Sandefur. 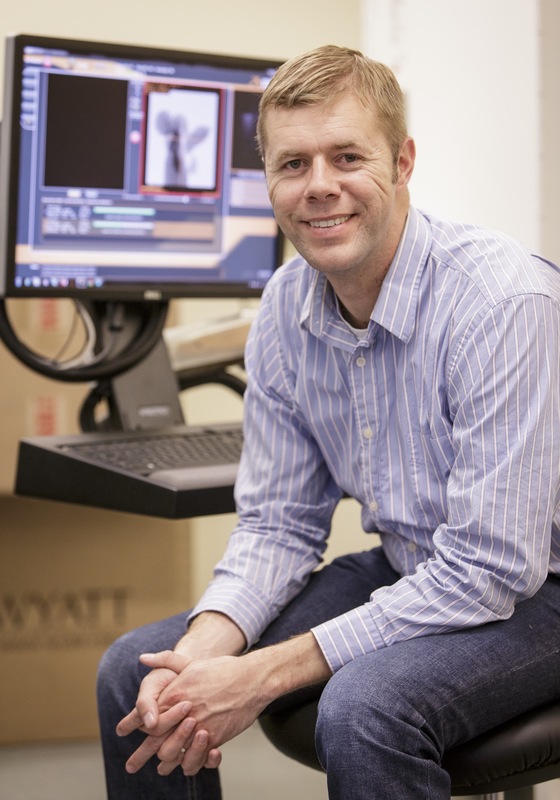 "By being able to retain and attract the most sought-after instructors and researchers through endowed faculty positions, Oklahoma State University is better able to support research and additional initiatives of the faculty members," he said. "That, in turn, gives the university the best chance to provide students with the best instructional and academic experiences, provide research opportunities and more easily share that research with the public." The Davis Chair has supported and will continue leading the School of Hotel and Restaurant Administration toward excellence, and allows the School to have a greater impact as a world-leading hospitality and tourism program. As the holder of this prestigious endowed chair, I have been able to contribute and make a significant impact on teaching and students’ learning, research and scholarly activities, and outreach and service that benefit students and external stakeholders. The endowed positions create continuity in funding, research and instruction, Sandefur added, which bolsters the university's academic reputation. "When there is continuity with faculty, there tends to be the same type of retention with students," he said. "Once students establish a rewarding relationship with faculty members, those students tend to want to continue their educational experience under those faculty members and those institutions." For more information about giving opportunities related to supporting our faculty, visit our Faculty Support page or contact the OSU Foundation at 800.622.4678 or by email at info@osugiving.com.